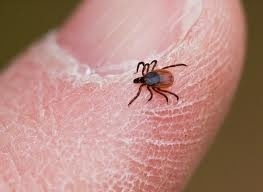 Lyme disease is caused by a bacterium, Borrelia burgdorferi. It was first identified in the U.S. in a cluster of children in Lyme, Connecticut in 1977, hence the name. The bacteria are transmitted to humans by the bite of infected deer ticks and cause more than 20,000 infections in the United States each year. Lyme disease hard to diagnose. It can have over one hundred symptoms and no two people are the same. The key to early treatment is to identify the tick and the bite. The bite is hard, itchy, and forms into lumps. A red, rash-like halo surrounds the bit and then slowly spreads outwards.